What do you want to see in next update? 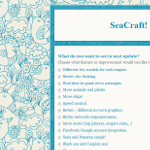 | SeaCraft! What do you want to see in next update? Please feel free to vote on most important change in upcoming revision or add your own! You can access Google Form here. Actually, I’d like to see multi-language support in next version. I’m a Chinese and I enjoyed a lot, but seems like there’re some ping issues that makes my ship a lil bit hard to control but still, the game is quite awesome. Back to topic, when I would like to recommend the game to my friends, they’re complaining they don’t understand most of the language, and it makes me harder to recommend the game to the others. So, will you consider that? Hi, your game is very nice! However I have encountred a problem: now I can’t play because it says the internet connection lacks, but I can go to other sites! What happened? We were experiencing technical difficulties – in other words I managed to insert some illegal characters in DB and it failed perfectly. Luckily I fixed it somewhat quickly, and made sure it doesn’t happen again. Sorry everybody! This sounds tempting, honestly. I didn’t think it was published in China! :) It’s pirate speak language which is somewhat English… Maybe I can provide you with all the strings and you can translate them? I suppose town names and UI buttons can stay the same? Thank you. Now the connection is very stable. I have another issue: the ship got trapped in the dock of canakkale, in turkey. I can’t move because I’m bounced every time. It seems also impossible to cross the bosphorus. Yea, many cities/canals need a retouch. I hope I will deal with it soon. Please send me your username so I can help you out. Thanks for reporting in! Thanks! Keep up the good work. The game runs very well on windows phone. Ships should have the same cadence but from a different attack. The current frigate’s gun. When the battles would be more maneuverable. Plunder towns would not be so easy. Example: 20 Attack / 0.2 seconds would be 100 Attack / 1 second. Maybe I considered saving the game limited to two largest cities. Now there is a struggle in style: you see the enemy, sail to the port where I save a game, go for a duel. If you lose – never mind, won by opponent rid of me already. About shooting: As of now, all cannons are with same power, but better ships reload and fire faster. Towns shoot back at some random interval a number of times depending on their size. Are you saying that cannons should fire less often but with more power? Update is coming where you will be able to “invest” in town and buy up to two shooting towers, which will make towns harder to conquer. If you get sink you can loose significant portion of your gold and all items, which you can recollect unless someone else does it first. I sounded like fair penalty and thath often saving “keeps things real” and avoids (boring) repetitions. Deaths in multiplayer games are always about compromise. Great game, I recommend playing the SNES game “Uncharted Waters 2: New Horizons” for inspiration. Look forward to upgrading cities and perhaps to customize my ship using many types of different sails, crew, hull, cannons etcetera. for next update: 1) let the map open at max zoom, not minimum zoom. Double tap zooms out. Generally the map is necessary to see the immediate area more often than needing to see the entire world. 2) Map is either off to one side, or is a transparent overlay. It’s in the middle of the screen and covers up the players ship. Collisions occur due to not being able to see what’s happening. 3) make the speed controls more obvious. Just a thought: It would be interesting to have a second flag with either symbols or colors on it, for communication. This could be manual or automatic. Peaceful trading ships could hold up white flags. Meanwhile, a vessel that has recently fired cannons would have a black flag. Great game, I started playing yesterday and it keeps me coming back for more plundering. I have recommend some friends to keep an eye on this one, but there are some bugs that make it unbalanced and almost unplayable. First I managed to get the best ship in a matter of 1hr, because two wealthy city’s sold either very low, and the other bought very high. Plus they where only 30 seconds from the other. Second, I don’t know if its just my tablet (nexus 7) but the game crashes almost every 5-10 minutes. I am unable to sail across the oceans with out having to stop at a port to save my progress every minute. Great game, but in the next update maybe a few fixes, tweaks, and a bit polishing up would make it a all time favorite. Great game. Just purchased the paid version after hours of gaming with the free one. I have question since I don’t seem to find a FAQ, forum or info regarding. How can I migrate my progress from the free sailor version to the paid version? I noticed there is a migration key button in the upper right corner of the start menu, but I can’t figure it out where to use it. Just change your name to empty string and press Play. Or just reinstall and press Play without entering your name. Make sure you got your migration key from the migration button, or let me know and I will generate one for you. I’d like to have my account again, but it doesn’t work because I lost the code. Please help. THINGS THAT SHOULD STAY THE SAME: The overall simplicity of the game. I like how you’re not inundated with menus or feeling like you need a tutorial. I like how you can go to a town, pick an assignment and continue on your quest all in a matter of seconds. Steering and shooting is a joy–I especially like the “creaking” sound of the wheel as you turn it. THINGS THAT COULD USE SOME IMPROVEMENT: I noticed that the paid version crashes a lot more. I thought the buy/sell portion in the market could have used a little more explanation in regards to the numbers. As mentioned before, the map should be either transparent or moved off to the side. Cannonball animations should match the actual number of cannons each ship has (for example, my 8 gun Barque only shows 3 cannonballs when I fire). THINGS THAT I’D LIKE TO SEE IN THE NEXT UPDATE: Randomized storms at sea, coral reefs or icebergs near the poles might be a neat idea as part of a “hard” or “semi-realistic” difficulty setting. Have the town menu screen better reflect the culture of the region that you are in. And most of all, I’d like to see an “offline” mode where you can just wander the globe without worry. Thanks for making this game, it’s one of the best I’ve played! i can’t remember which name I used but I got the e-mail . ny migration key isn’t working sent my tablet in for repairs just got it back . help pls :).